I am nearly at the finish line! In about 3 weeks or so I will endure the radical pains of childbirth to meet for the very first time, my daughter, Piper Evangeline. I look forward to no longer needing 8 pillows when I sleep to help my particularly round body get comfortable and keep me from the fears of accidentally doing the unforgivable sin of pregnancy— lying on my back. My husband thinks I take up the whole bed…it’s totally in his head! I also look forward to no longer expelling all my energy from just simply talking. Piper’s most favorite spot in my womb is right up in my diaphragm, so I get out of breath all the time! I look forward to no longer needing to figure out the best ways to dress myself. In the beginning, I loved showing off my baby bump with what I wore. However, I am at that point where I think I have lost that “cute factor” and would rather wear one of my husband’s t-shirts all day everyday until I give birth. Truthfully though, my pregnancy has been pretty amazing. I have friends whose pregnancies sound like 9 months of pure tormented discomfort and they just can’t wait for that baby to finally make its way into this world. Even in my very little discomforts, I have thoroughly enjoyed my growing belly and I have especially loved feeling my daughter kick and punch different parts of my tummy. In many ways, my pregnancy has been a breeze. However, I must say that even with a wonderful and uncomplicated pregnancy, I am more terrified for the looming role as “mommy” than I had anticipated. My fears of motherhood find their roots deep within me and leave me feeling completely ill-equipped to be a mommy. My fears are selfish, driven by the approval of man or my lack of control over the unknown. My fears leave me with so many unanswered questions: What if I am not good at being a mom? What if I don’t love it? What if my friends and family don’t agree with my philosophy of parenting? Do I even have one? What will I do if my daughter is never saved? Will my friendships change? What if motherhood is lonely and isolating? What if I fail my daughter…or my husband…or my church? I don’t know if moms will admit it, but what I have learned in my pregnancy is that there is a profound inward war among moms, soon-to-be moms or even women without kids, where they battle over topics like “the best way to birth a child,” “breastfeeding vs. formula,” “homeschool vs. public school,” the “proper way to discipline,” “what we feed our babies,” “strict vs. loose schedules,” etc. On and on the wars keep building up. My esteem, my energy, my confidence, my bravery… all mere casualties of this never-ending barrage of expectation. I keep trying to figure out the best route to take to become this amazing, all-star kind of mommy for my church, for my friends and for my family. Of course, there is tons of advice on ways to grow in motherhood. However, in my opinion, the worlds view of motherhood is so limited and fruitless. If my husband is flabbergast about the ways I parent, that will not make me a good mother. It will only fuel my self-sufficiency and my pride into believing I am better than my husband and other mommies because my performance is obviously such a profound mystery. Puffing up my child’s ego by telling them how special they are will not make me succeed at motherhood, neither will it tell them how much they are truly helpless, in need of a Savior. In learning how to be a mother, I need something more hopeful…more promising…more reliable. I need something that won’t call me a failure as a mother if my daughter throws tantrums every time she has to share or struggles to be a polite, well-mannered kid. I long to be recognized and seen as the “perfect mommy”…but the stark truth in that particular longing, is that I never will be no matter how hard I try. Truthfully, that thought hurts. In fact, it is an incredibly sanctifying thought for me. I used to love that song “You Make Me Brave” by Bethel, and would sing out the lyrics worshiping God and imagining myself a warrior overcoming the fears that plagued me. I do believe that in our weakness, God absolutely can give us the strength and endurance we need through difficult and overwhelming circumstances. However, as I considered the idea of bravery in the midst of my mommy fears, I realized that I don’t need a God that will “make me brave.” I don’t need a God that will push me towards more self-sufficiency and fluff up how great “I am” to overcome my own fears. Today, I am profoundly aware that I need a God that will move my heart towards a more profound awareness of my helpfulness and thrust me to a greater dependence and desperation for my Savior. I need God to remind me that I am nothing without him. I need God to radically reveal my desperate need for him. When I think about raising Piper in our wicked, liberal world, I don’t feel brave. I feel helplessly and vulnerably dependent. Our sin, that is exposed in parenting, will not detract or belittle from the power of the Gospel, but rather it will show why we need the Gospel. Pride cannot teach you how to desperately depend on God to become a godly mother. It will only drive you deeper into yourself and therefore deeper into the sin itself. The gospel is the answer to our brokenness. The gospel is the answer to our relentless self sufficiency. The gospel is the answer to our total inability to live out biblical motherhood by faith — totally dependent on his grace with an upmost desire for his glory. Our children need to see us treasuring the things of God (glorifying him) and depending on his all-sufficient grace. I am convinced that the only way I can truly parent Piper, and the only way we can truly parent our children is by being completely and utterly dependent on God. Dependent on him to save and keep our families including our children. Dependent on his sovereign plan, because it is for our good and his glory. Dependent on him to grant us repentance when we fail as mommies. Dependent on him to shower us with the grace to accept our limits. 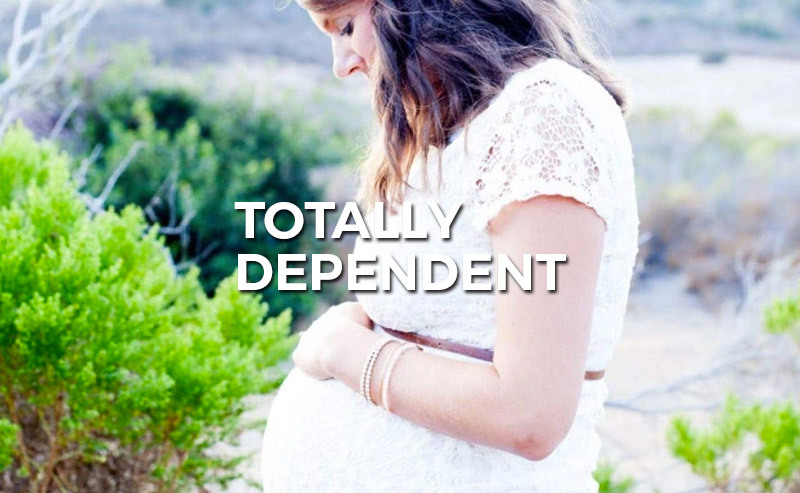 Dependent on him to fill us with fervent faith to trust him more… Totally dependent.